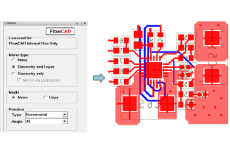 This FloWare module enabled the User of OrCAD or Allegro PCB Editor to mirror individual elements based on parameters. The app enhances the possibilities of PCB Editor to mirror elements. It is possible to mirror even while place and route. Mirroring can be performed either across subclasses or on the same subclass (geometry only). Often there is a requirement to design two printed circuit boards which are symmetrically mirrored. The left and right PCB shall have the same geometry (boundary, shapes, major tracks) but one of them is mirrored. This shall provide the same electrical behaviour for both PCBs as much as possible. But the problem are the components. They shall be mirrored at the location, but remain on the same layer (i.e. top). FloWare Module Advanced Mirror provides the user the possibility to filter a selection in PCB Editor of all elements which shall be mirrored. If parts and tracks are mirrored, there will be of course lots of DRCs, because the component pins cannot be mirrored. But the time to clean up and reconnect components at the right location is for such applications often less than building up a symmetrical PCB from scratch.